Series DZ motor vibration feeder is a new type feeding equipment researched and developed by our engineers. It can be widely arranged in the lines like metallurgy, coal, chemical industry, building material, ceramics, grinding and foodstuff etc., to feed the block, granular and powder material into the receiving hopper from storage bunker evenly and continuously. 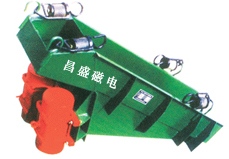 It is suitable for automatic burdening and controlling,ration.